The machine deals with Tom Bearden's Four Wave Mixing. The machine deals with a low frequency pump wave through a modulation transformer. The machine uses all Ne555 timers set to select frequencies Values for the first timer are as follows, The current through the electrodes must not exceed 50 Micro Amperes. 220K variable pot set for low freq square wave 50Cps between pin 7 and 6 pin 2 and 6 tied together The cap value .22Uf pin 1 to ground. Other values are in the same arrangement. IC 6 Set to highest frequency. Hi John. Thank you for sharing details. I'm working on Bob Beck device a.t.m and want to build this one as well. I have now made the diagram available so the machine may be duplicated. Thank you John. I have Arthesian well with small pond but need to get better microscope, preferably the one I can hook to the PC. I need this for other experiments as well. I'll post as soon as I get it done (hopefully next week). thanks John, thats a better picture of the circuit than the one i had, whats the small diode in the top right hand corner? 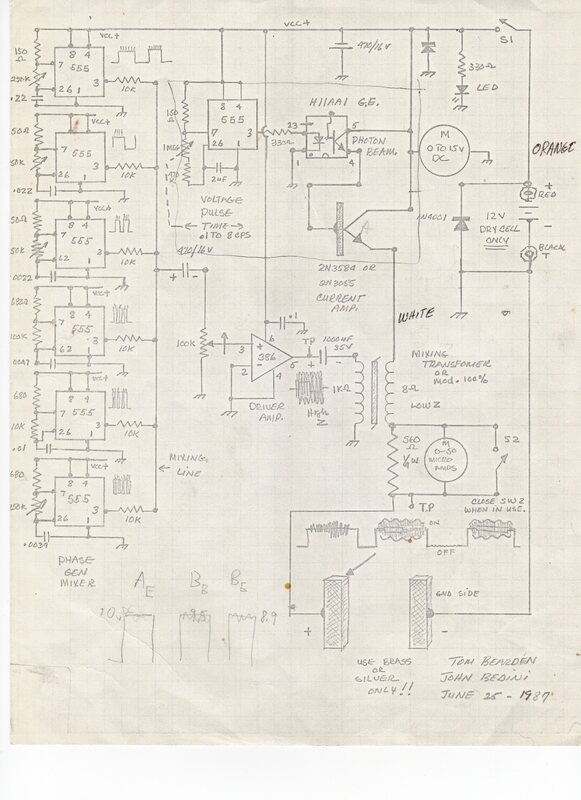 Thanks for the completed schematics. I have couple of questions for you, if you do not mind commenting on them? 1. What is the significance of non-CMOS vs CMOS 555 (you said to use non-CMOS)? 2. Why is it necessary to opto-couple the Pulse Generator and the Current Amp? 3. Incidentally, what is the tuning for the Pulse Generator (4Hz that Bob Beck and others used) or perhaps fundamental Schumman Resonance? 4. How and where are the electrodes applied (Bob Beck way on the lower arms and blood vessels or elsewhere)? What is the spacing, if elsewhere, and if known what is the impact of the variable spacing between the electrodes? 5. In the Phase Generator why certain channels have a variable pot while others are fixed. Is there a significance of that fixed frequency? 6. Is the combination of the specific frequencies (once set) of each individual channel, and mixed together, of more significance in the final waveform? 7. What are the boundaries of the lowest/highest frequency (all channels) output in the Phase Generator (sorry I did not run this through a circuit sim yet)? 8. Obviously with those variable pots, they would need to be individually tuned for specific application (virus), also referring back to 5. and 6. 9. Because of 8., could the Phase Generator not be substituted with a broad band sweep generator fitting the frequency ranges of each channel? 10. Further to 9., ie. if a micro-controller is used as a sweep generator, each channel could then be more efficient as it would cover entire frequency range at once. What are your thoughts about this? 11. Hypothetically speaking, could the electrodes be replaced with perhaps a piezo ceramic transducer (if the frequency range of the output is not higher than what piezo supports)? I presume the power output would need to be adjusted to sufficiently excites the transducer, but the application would then become contact-less and much easier to handle. Sorry if this might look like a lot of questions - I do appreciate you answering them. The timers need to be free from glitches, so no Cmos. You can do what you want but I would try this first. As I have always said you need to make it as is first. then you can change to what you want. Low pulse running at 7 Hz. This is not easy to adjust unless you have a microscope to look at what is going on. Micro currents modulated do the job if the frequency are set correctly. Electrodes are placed on the body in the selected area. John Crane tried a Microprocessor and it did not work. John Crane sold machines that did not work , basically it was just a frequency generator, but in the case of this machine all frequencies are combined and then you need to have a pump wave at 7 Hz. I do always remember your words: "Build it the way it is first" - I'm just trying to understand how this works, why, and what to look for to know it actually does work. How do you know what to tune the individual Phase Generator channels to (the ones with the variable pots)? You mention use of a microscope and pond water, presumably due to prevalence of bacteria in the pond. How would you connect the device to the sample slide (using platinum wire electrodes) for real-time observation? The final output appears to be a complex waveform composed of a square carrier with amplitude modulated frequencies embedded into it. Was the pulse carrier (at 7 cps) portion made to be square wave due to practicality, or is there more significance to using the square pulse? I ask this because I remember seeing a documentary about Rife in which they showed original scope views of the waveform that used a sine wave as a carrier, also having complex waveforms mixed into it. Yes that is correct it is a complex waveform mix of square wave frequencies with current modulation. I'm sure you could find many ways to do this. It's the harmonic content of the square waves. I have played around with these type of machines forever. My aunt used it and it killed whatever she had, I can't really talk about it as I almost had the AMA on me so I quit building them and DR. Strecker disappeared after that. John Crane they almost locked up but he also took off got away just by luck. This is no different then a complex audio mixer using current modulation. Some people have used a low pulsed 7.831 magnetic field with this machine. I have found that the frequencies Rife had back then do not work today as everything is much different. "WE as people have things that have mutated into something else. It does not make any difference who you are we all get sick, just some faster then others. And you are talking about the Albert Abrams Machine Tom C took pictures of the one I have here, He might post some pictures if you ask him. It works by opposing magnetic fields modulated by the contact spark. That is the machine in the movie generating that waveform you see. The Monopole Energizer generates the same waveshape as the Abrams machine. I AM A RESEARCH ENGINEER, NOT A MEDICAL DOCTOR, AND THEREFORE DO NOT MAKE ANY MEDICAL CLAIMS FOR THIS TECHNOLOGY. Thank you so much for the extended explanation and full schematic. I have all of the parts on hand, and will be building this ASAP. Thank you for all of the years that you have been my mentor, and I haven't forgotten all of the hours that we discussed your machines, at great length. For all of that I am very grateful.